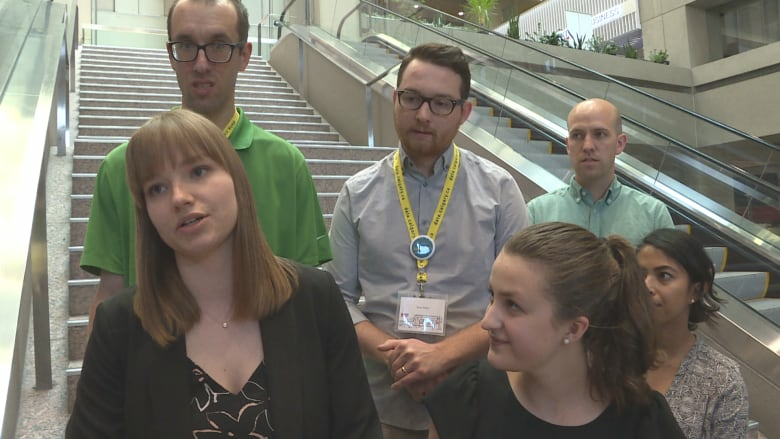 Hackathons are usually focused on high-tech innovations, but this weekend’s event hosted by the City of Calgary looked at solutions for making a decidedly low-tech activity more enjoyable: walking. Hackathons are usually focused on high-tech innovations, but this weekend's event hosted by the City of Calgary looked at solutions for making a decidedly low-tech activity more enjoyable: walking. The city's annual event brought together bright minds from various disciplines to brainstorm solutions for making Calgary more livable. For the first time ever, it was centred on a theme: pedestrian comfort. And, perhaps fittingly, some of the winning ideas geared at improving the pedestrian experience in the city were decidedly analog. "This is actually not an app. This is an interactive experience that exists in real space," said Gabrielle Dickson of her team's winning submission in the Play category. The team's prototype, Near Here, uses simple materials — poster board and pens — to encourage community residents to share their favourite walkable destinations in their neighbourhood. The idea is simple, too. Community residents simply use the board to write down directions and walking time to the location of their choice. It can also carry over into social media sharing using hashtags, said Dickson, a fourth-year information design student at Mount Royal University. "Essentially, we decided to combine the idea of public art, a community bulletin board and guerilla wayfinding to really empower people to share their favourite walkable destinations in a given area," she said. Dickson says a road test of the idea on Stephen Avenue in the downtown core proved popular. "We had a lot of engagement from people who were walking by and wanted to share ideas, and people who wanted to get ideas from the board." Hackathons are usually events where computer scientists, coders and other experts get together for an intensive period of collaboration to try to create new software solutions. But the City of Calgary's event attracted a wider variety of experts, including transportation engineers and even sociologists. The team behind Near Here was particularly diverse, showing that a multitude of disciplines can make for more innovative solutions, says Sarah Ali, a sociology graduate from Mount Royal University. Her favourite part of the experience was working on the idea with people from different educational and professional backgrounds. "It was nice to work in collaboration and see the different ways that people think and come to understand a certain problem," she said. Dickson said her team's concept would make use of the city's open data sets to determine the best places to put the bulletin boards. "So we want to make sure that we're strategically placing them where there's a lot of pedestrian traffic," she said. Technology played a more central role in some of the other solutions, such as a re-imagined app from the Pathways team that seeks to make navigation of the city's Plus-15 system more accurate and safe. "The current app is actually not functioning properly," said James Kayode Olusoji, part of the winning team in the safety category. "So we've come up with this project. What we've done is to try to simplify the app in such a way as it's more user-friendly." That includes implementing QR codes people could scan when they get lost in the warren-like pedway system, and specific directions for pedestrians, similar to Google Maps.